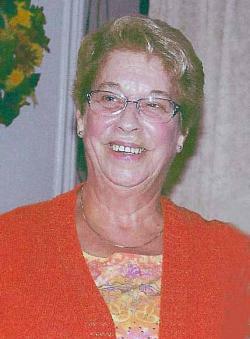 Hazel M. Cyr, 80, of Moncton, passed away peacefully at The Moncton Hospital on Friday, April 12, 2019. Born in Campbellton, she was the daughter of the late Phillip and Eva (Allain) Day. She was a former employee of The Moncton Coliseum and enjoyed knitting, crocheting and playing cards with her group of girlfriends; but most importantly Hazel enjoyed the precious time she had to spend with her family and caring for her home. Hazel will be sadly missed by her husband, Albert Cyr of Moncton; children, Shawn Cyr (Kerry) and Allison Langille (Tim); grandchildren, Connor, Brahm and Madeline. In addition to her parents, she was predeceased by her brother, Ronald Day. A Service to celebrate and honour Hazel’s life will be held from Fergusons Funeral Home Chapel, 1657 Mountain Road, Moncton (858-1995) on Tuesday, April 16, 2019 at 10:00 am with Rev. Allison Carroll presiding. Reception following the service in the Funeral Home Reception Centre. Interment will be in Our Lady of Calvary Cemetery, later in the spring.